The hot, dry 2018 summer has been favourable for maize silage quality. There is a noticeable difference in the quality of maize harvested in 2018 compared to 2017. Higher levels of starch recorded in crops means it is important farmers are aware of the nutritional opportunities and challenges that the silage poses and its potential impact on rumen health and cow performance. Now is a good time to assess your maize silage stocks. Analyse the quality of your maize silage and predict how this silage will complement the use of current concentrates, forages and even grazed grass. Once the quality of your maize silage has been established, it is important to gauge how long your supplies will last, what your approach will be to fill any identified shortfall and if you are likely to feed maize in conjunction grazing in the Spring. Starch is an important source of energy in maize silage and when broken down in the rumen, can have a significant impact on improving glucose potential and milk yield. When maize is clamped its feeding characteristics, especially starch degradability, start to transform. The longer that the maize is sealed in a clamp the greater the fermentation rate, starch degradability and the reduction in the levels of by-pass starch (DUS). With higher levels of fermentable starch recorded in maize this year, there is the potential for higher energy availability from silage and higher milk yield potential. There is also an increased risk of acidosis (AI) caused by this more fermentable material. This risk becomes higher later in the season when maize has been exposed to fermentation acids for a longer period (see table below). 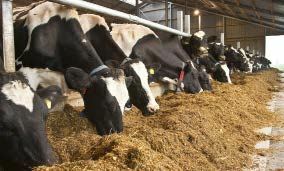 It is important to limit the inclusion of other starch rich feeds when using high starch maize silage and carry out regular ration analysis to ensure that a herd’s diet is balanced. Too much starch in a cow’s diet can reduce milk yield and stage of lactation will impact this. Excess starch in late lactation cows will increase body condition. Excess starch in early lactation cows could result in acidosis. The increased risk of acidosis caused by more fermentable maize silage also needs to be managed and the use of a live yeast (Levucell TITAN) or rumen buffer (RumiBuff) should be considered to maintain rumen health in more challenging circumstances. The use of digestible fibre sources, soya hulls or sugar beet pulp (non molassed) as concentrates can also be useful tool to help improve overall rumen health. When more starch is needed in the ration consider the use of maize meal, ground maize and/or caustic treated wheat as a rumen friendly alternative. The feeding characteristic of maize change over time in the clamp. Below is a box which highlights the issues surrounding an earlier or later feed out. Lessons from this year’s silage can help to improve quality for next year. Look for signs of heating and remember that if silage is dry it is more difficult to consolidate.